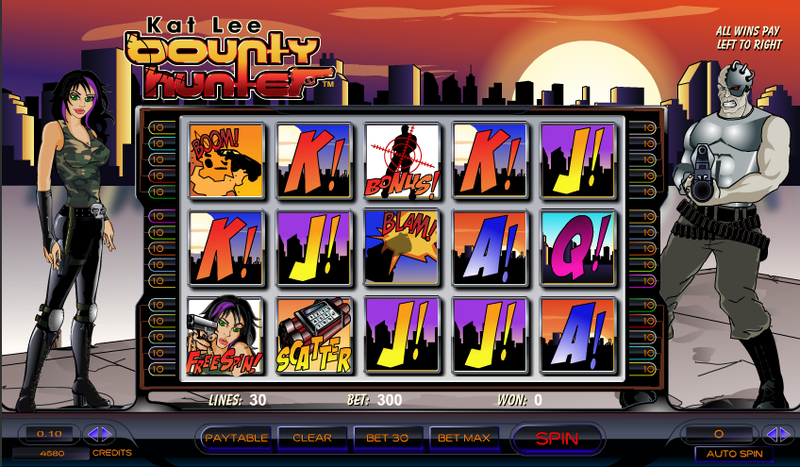 It’s always a good sign for us when we find an online slot designed with a comic strip in mind; Kat Lee Bounty Hunter is one such game – it’s not based on a real character but the traditional comic book-style works well anyway. This was originally a Chartwell game before that company was acquired by Amaya Gaming in 2011. Kat Lee Bounty Hunter plays out over five reels and thirty paylines and the theme’s narrative tells us of Kat and her male friend, hunting criminals in a futuristic setting. The backdrop to the reels is the glowing sun setting over a cityscape with the main protagonists on either side of the reels. Four nicely-drawn action scenes are the main symbols while a J, Q, K and are the lower values – still rendered in that comic strip style. The Bounty Hunter icon is wild, the male and female characters are bonus symbols, there’s a targeted silhouette bonus symbol and then two scatters – a bomb and a hand grenade. There are a meagre three spins available here and you can trigger this feature by landing Kat Lee on the first reel and the male character on the fifth reel. You will get a multiplier of 3x for any wins you land here but the spins can’t be re-triggered. 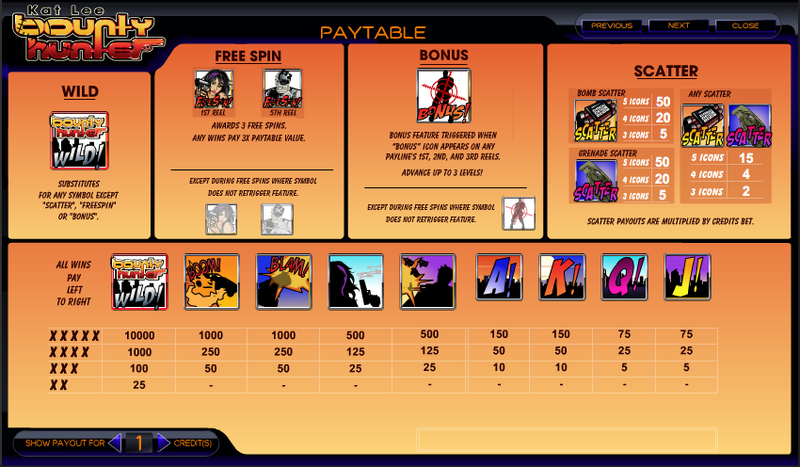 The slightly more exciting game is triggered by landing three of the target silhouette symbols on an active payline on reels one, two and three. A screen displaying a number of crates will be displayed and you must shoot two; each will reveal a prize or a notice to advance to the next level where the prizes are greater. There are three levels in total with increasingly valuable prizes. The main feature is triggered by symbol an an active payline so if you want to go for that, play as many paylines as possible. This is a rather basic-looking game which isn’t anywhere near as exciting as the subject matter would suggest. It might have been entertaining some time ago but there are far better slots out there now.